Mount Ausangate (6,377mts/20,921ft) is the highest and most sacred mountain in Southern Peru, which for centuries has been central to the religious beliefs of the Andean people, who still go on annual pilgrimages to its icy slopes. With spectacular glacial vistas, uninterrupted beauty and solitude, this is a spectacular trip for seasoned trekkers who love a true outdoor adventure. 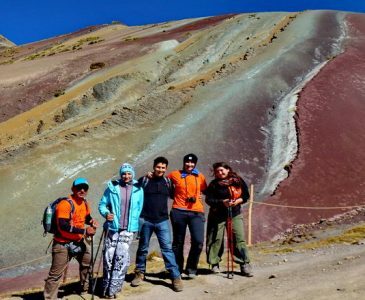 Click on the link to find out more about our Ausangate Rainbow Trekking Experience..! 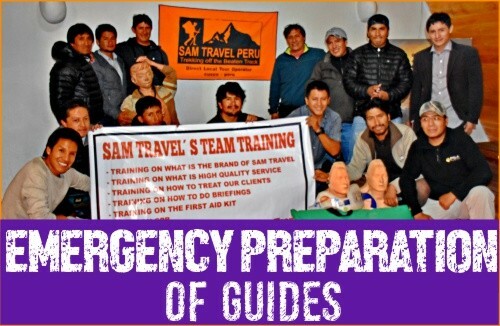 We will pick you up from your hotel in Cusco at 4:00am to begin this amazing hike! We will drive for 2 hours until we reach the Pitumarca Village, where we will stop to collect supplies and then continue for 1 more hour to Qesuno community. Along the way, we view amazing canyons, Inca farming terraces, rugged mountains and some isolated communities. Upon arrival, we meet our horsemen and horses. We begin our hike gradually heading up to the Kayrawiry community where we have lunch. After enjoying lunch and taking a little siesta, we continue our hike towards RAINBOW MOUNTAIN. Once there, we will enjoy the amazing colored mountain, which is the highlight of the day. We will also see a lot of vicuñas, condors and amazing glacial lakes. Finally, we hike downhill to Kayrawiry Lake, where our camping tents will be ready. It is time to enjoy an afternoon tea and dinner. We will wake you up early in the morning with a hot cup of coca tea to start one of the most beautiful days of the trek. 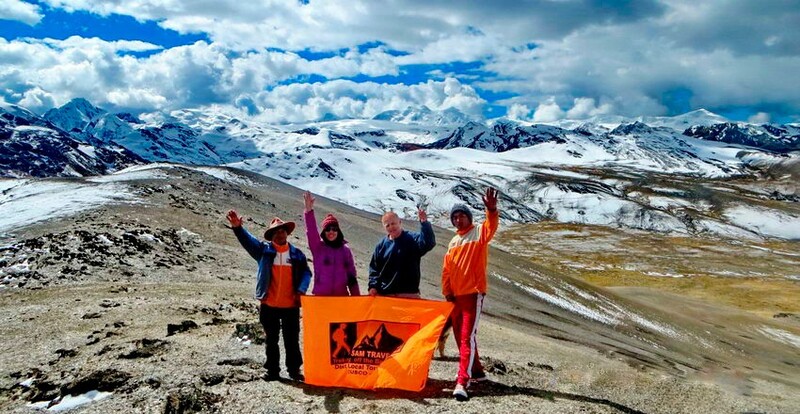 You will enjoy the majestic views of some of the highest peaks in the Andes and the depths of the beautiful valleys. 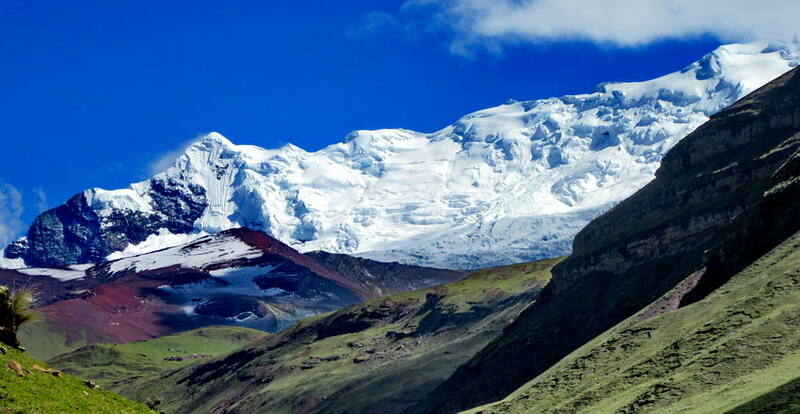 After an early breakfast, we will start with a 2-hour steep climb to Condor pass at (5100m/ 16732ft) in elevation. Along the way, you will always have gorgeous views of the blue lakes and the majestic views of Ausangate Glacier Peak surrounding you. Sometimes you can see avalanches happening from the glacial hills with ice crashing into the lakes below. Once you reach the summit of this mountain, you will be located right in front of Ausangate. There you can really enjoy the valleys of alpaca grazing amongst the hills. It is so impressive! After time to enjoy the amazing views from the pass, we head downhill and reach our lunch spot. After a little siesta, we continue with our hike for 3 more hours to Ausangate Lake where you will enjoy our famous daily happy hour of hot drinks and settle into our campsite for the night. After an early and nutritious breakfast with your trekking team, you will prepare for the third day of the hike. 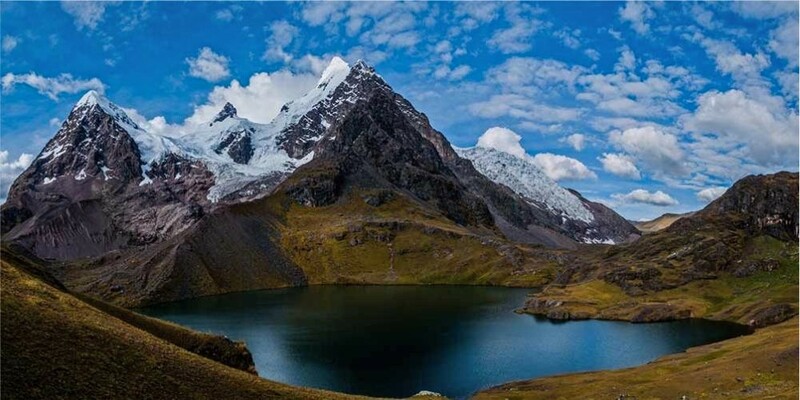 Today you will be hiking very close to the wonderful views of the Ausangate Glacier Peaks, experiencing spectacular views of lakes and waterfalls. You may even see some llamas, alpacas and wild vicuñas (the undomesticated ancestor of the alpaca) as well as condors soaring above. We will have a 3-hour ascension to reach the Abra Campo Pass, which is at (5000m/16404ft), where you will discover magnificent views of the surrounding areas. It is possible that in some months of the year, we will have snow hikes, but mostly in the dry season, you just get great views. There is a good chance you will see vicuñas, which are the most impressive animals still living wild in Peru, they belong to the family of Andean Camellias. Their fleece is the most expensive wool in the world today. After taking a few amazing pictures we continue to our lunch spot, with a gradual descent for another 1.5hours to a beautiful area where you will enjoy your second day’s lunch. It will be another 2.5-hour hike to arrive at our campsite in JAMPA. After 3 days of hiking and acclimatization, on Day 4 we are ready for another adventure! We take breakfast early and begin our hike of approximately 1 hour to reach the glacier base and then to the top of the mountain! After enjoying the spectacular views of the Vilcanota Range, we descend back down to enjoy a delicious lunch. In the afternoon, we descend towards the Qomerqocha Lagoon just before arriving at Pacchanta after a 5-hour walk. Pacchanta is a little community with attractive hot springs where we can enjoy a relaxing dip. Then we take our transportation back to Cusco. This trek is available to depart any day of the week as long as we have two people. Our itinerary is slightly different than the other trekking companies. Our camps are far away from others and we visit the 2 amazing glacial lakes when no one else is there. 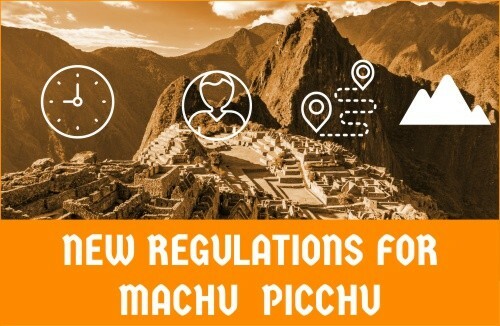 We hike up to Llactapata Inca ruins which is overlooking Machu Picchu and you can enjoy the guided tour into Machu Picchu in a small group group. 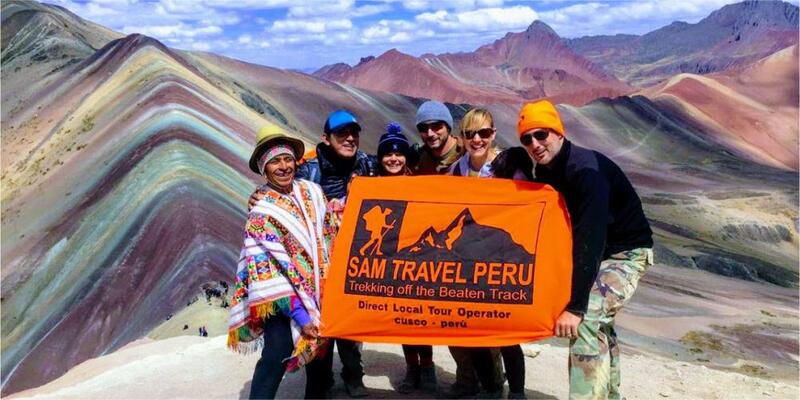 Hiking the Salkantay Trek to Machu Picchu with SAM Travel Peru is a life changing experience with a fully portered trek where your comfort and enjoyment are our first priority. We make sure that you get the best experience for your holiday in Peru while you interact with the locals, explore fantastic sites and re-discover remote ancient Inca towns and buildings. Having the opportunity to learn some words in Quechua and about the fascinating Inka history. 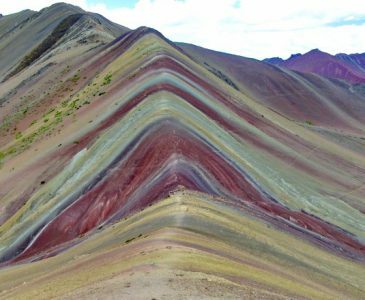 Immerse yourself in the stunning landscape and simply feel the magic of Mother Nature (Pachamama) and the Andes. We carry your gear, prepare your meals, set up your tents avoid crowded campsites and take care of you while you sit back and relax. Of course! During the Salkantay trek to Machu Picchu your main luggage can be stored at our office or at your hotel, both are for free. 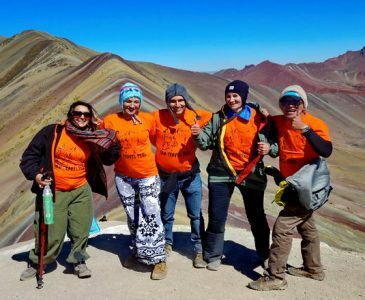 FIRST, to book your Ausangate Trek, we need you to fill out our booking form by clicking on BOOK NOW on our homepage or click here the link BOOK NOW. *** If you cancel your Ausangate Trek, the deposit is not refundable at all! The weather is very unpredictable and it’s difficult to foresee. BUT you will have many different seasons as you pass through the numerous microclimates and will depend on the location. With the Ausangate Trek, we highly recommend you bring some very warm clothes and good rain gear in your day backpack. It can be very cold at the high altitudes of this trek. The evening before you start your trek, you will be given a SMALL DUFFLE BAG to pack your clothes for the next four days. Your weight allowance is up to 7kg/14p. Your team of porters will carry your duffle bag for you, together with the food and camping gear. It’s important to be aware, that you will not have access to your items in the duffle bag until the end of each day, as the porters will always be ahead of the group. During the trek, you need a day backpack big enough to carry your personal belongings such as a warm jacket, a rain jacket, your camera, sunscreen, snacks, water, etc. Usually a 30 to 50 litre backpack is sufficient.